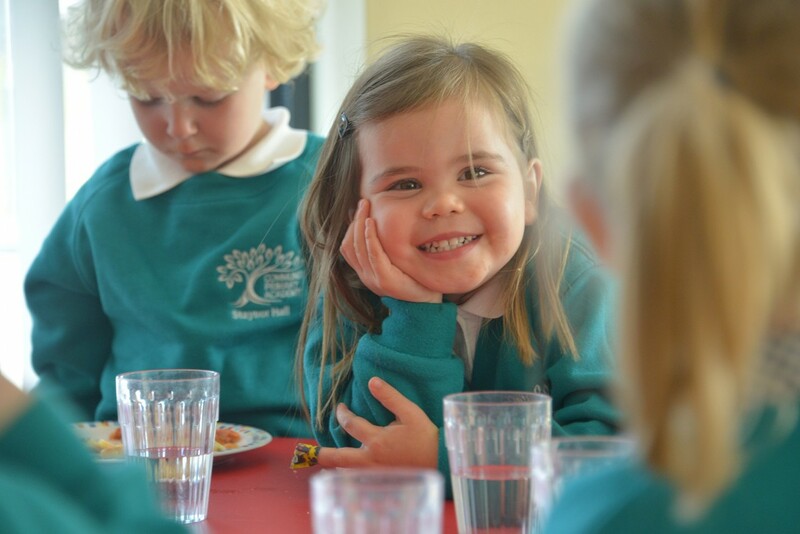 Being part of a community is integral to our values and ethos at Staynor Hall Community Primary Academy. This is a thread that flows throughout the whole of the school day and beyond. We want to maximise the opportunities for this and lunchtime is no different. In our school we operate a system of ‘Family Dining’. Children in Reception to Year 2, all take a hot lunch, whilst children in KS2 have the option to bring a packed lunch or take a hot meal. We do, however, like to encourage as many children as possible to take a hot lunch. Even if you think your child is a ‘fussy eater’, you will be surprised how well they eat when all their friends are sat around them, eating the same meal. We have a chef who specialises in providing healthy, nutritious and delicious food with plenty of variety and all food allergies and dietary requirements are catered for. Family dining is an opportunity for us to enjoy lunch together. Teachers and children sit and have their lunch at tables of 10 – all in mixed aged groups. It is a chance for siblings to sit together (if they wish!) and for the younger children to sit with older ones – providing good role models. The food is served to the table and the older children serve it onto plates and we eat our lunch together. 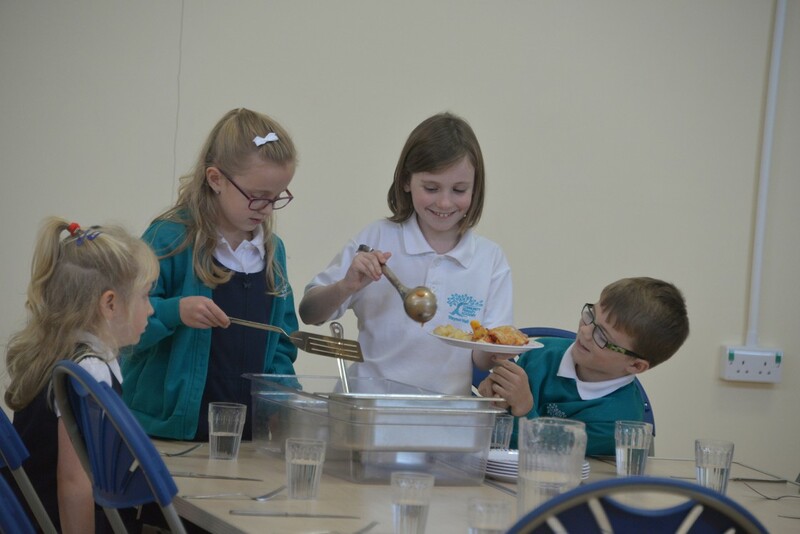 It is a chance to really get to know each other and also for us as a community to enjoy our lunch in a calm, pleasant and enjoyable way – rather than what can sometimes happen in other schools: children queuing, a noisy school hall and plastic trays – not particularly pleasant for anyone. After lunch, the children go out to play supervised by the Assistant Teachers who support them in their class – adults who really know your children and help get the best out of them. For payment details please see our ParentPay information sheet. If you are entitled to free school meals, or think you may be entitled, please see the free school meals information sheet. Some parents do not take up their entitlement because they are worried their children may be stigmatised – please be reassured, this is a discreet issues that is sensitively handled by our staff and there are no instances where free schools meals children are treated differently.